Members of GeoThermH2O celebrate their win. From left,Varun Sreenivas, Shanisha Smith, Rose Sobel and Amin Kiaghadi. The competition, held Friday, May 1, in Austin, featured five teams of graduate and professional students from across the state, tasked with researching and developing the most creative and cost-effective use for water produced from the hydraulic fracturing of wells. As the first-place winner, the UH team won $10,000 in scholarship funding. Each team was made up of graduate students from engineering, business and law; the other teams were from Texas A&M University, the University of Texas at Austin, UT-El Paso and Texas Tech University. Hydraulic fracturing uses sand, water and chemicals, pumped at high pressure into a well, to fracture the dense rock formations and release oil and natural gas, with millions of gallons of water returning to the surface along with the oil or gas. There is a growing desire to recycle or reuse that water, although the cost has kept many companies from doing so. Most inject the water into disposal wells. But concern about disposal wells – studies have linked wastewater disposal to small earthquakes, and many shale plays are in water-scarce regions – has spurred a search for new ideas. 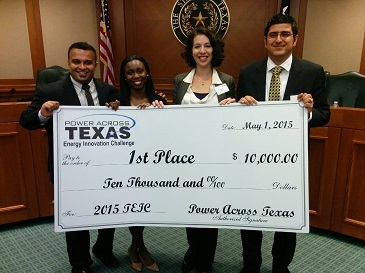 The competition was sponsored by Power Across Texas, with a panel of judges from the energy industry. UH team members, using the name GeoThermH2O, proposed to harness geothermal energy from decommissioned wells to reduce the cost of water treatment. Team members include Amin Kiaghadi and Rose Sobel, both Ph.D. candidates in environmental engineering, Shanisha Smith, a lawyer who just completed a Master of Law degree, and Varun Sreenivas, an MBA student specializing in energy finance and the energy supply chain. Faculty advisors included Hanadi Rifai, professor of civil and environmental engineering; Zachary Bray, assistant professor of law; Radha Radhakrishnan, clinical assistant professor in decision and information sciences, and Konstantinos Kostarelos, associate professor of chemical and biomolecular engineering. Executives from Houston-based Rockwater Energy Solutions served as industry mentors. The team’s research found that while membrane and distillation technologies provide the highest quality water treatment, both require huge amounts of energy, making treatment more expensive than disposal. Under their plan, a closed loop system using a small volume of freshwater would be recirculated in the decommissioned well to power a desalination unit, capable of cleaning and recovering about 70 percent of the water. That treated water could become an inexpensive, drought-resistant source of water for agricultural and nonpotable municipal use. The team also called for tax credits for water recycling and increasing the cost of disposal as a way to spur the use of the new technology.